Your goldchat blogging service will have intermittent service interruptions over the next two weeks due to the fact that I'm in Singapore/Malaysia for holidays and my other half has this crazy view that gold blogging is not an authorised holiday/relaxation activity. I was aiming to get the series of fractional bullion banking posts completed before I left for holidays but it didn't work out. If it is not clear, I did not start this series with any idea of how it would end up or how long it would take. I had some general ideas on the topic but have just been exploring them as I go. That is why they don't seem clearly structured and I think it will be worth putting them altogether into one article and fixing them up into a more coherent whole. As an FYI, most of the posts in this series have only been getting around 1000 views with the "how can I default on thee" one getting 3600, due to a GATA referral. This is not surprising as the material is technical in nature. I'm consoling (deluding?) myself that it is the quality of the readers, not the quantity, that matters. I will do my best to try and sneak in a final (or two) posts in the fraction/run series. Now off to get some congee for breakfast - yum. Keith Weiner, president of the Gold Standard Institute USA, has the second post in a series responding to Tom Fischer's "Why gold's contango suggests central bank interference" which I blogged on here. The post focuses on the gold lease rate and Keith starts off by saying that "to answer the question of how the gold interest rate is established today, we must look at who the actors are and the mechanics of what they do." When looking at the actors using gold leasing he notes that "gold is not borrowed to finance purchase of long-term assets" but is only used by "businesses that specialize in gold, such as refiners, mints, and jewelers ... to enable them to carry inventory or hedge inventory" (such as the Perth Mint, which Keith notes is the only other business apart from his own fund business that keeps their accounting books in gold). However, he concludes that gold specialists use of gold is "similar in some ways to Real Bills ... used to finance inventory that is moving predictably towards the consumer" and thus that the "gold “lease rate” is conceptually closer to the discount rate of Real Bills than the interest rate of bonds" because the gold lease rate "does not emerge from the actions of either savers or entrepreneurs. Nor does it arise from the actions of the consumer and the retail industry in general". I think this way of looking at the gold lease rate is valuable to understanding the rate and thus GOFO and backwardation and what is may mean. PS, I was encouraged to see Keith's article get picked up by a number of sites, like ZH, Gold Seek, Safe Haven, FSN and Acting Man, for what is content that is more intellectual and technical, rather than the usual gold to the moon type tabloid stuff. In November last year I posted on some physical redemption from the Sprott gold and pt/pd funds. Since then there have been some more beefy redemptions, which is related to the fact that these two fund (and not the silver one PSLV) are trading at a discount - as I said in November, "as long as it continues to trade at a discount we should continue to see these redemptions." Fractional reserve bullion banking and gold bank runs - a bullion bank's "assets"
Yesterday I did promise to discuss how bullion banking is run differently and the implications for a gold run, but I realised that before I discuss the factors affecting a gold bank run I need to explain the types of gold “assets” a BB can hold. Only then can we understand the risks associated with them and then the dynamics of a gold run (no, I did not plan these posts out in advance). If you are someone without creditworthiness, which just means that a BB makes an assessment that you cannot be trusted to repay your debts, then a BB will require some security or collateral which they can access if you don’t pay. An example of this in consumer lending is a bank holding a mortgage on “your” home. neither the BB or the short selling borrower has any physical gold to mortgage as it has been sold. The short selling speculators may be considered low in risk because generally BBs will lend you the gold but also insist on selling it for you and keeping the resulting cash from the sale as collateral. Since the gold price is volatile, the BB will require you to put up additional margin. So a BB has both cash from the sale + margin to cover themselves. Mining companies are sort of like our jeweller or minter, in that they are a business, just that the gold they hold is in the ground and not in a factory. This is a bit more risky than a gold business as they may not be able to get the gold out of the ground at a reasonable cost or have some other operational problems. They are also more risky than a speculator as the mine used the cash to pay expenses or buy equipment, so there is no cash left to use as collateral (the BB could mortgage equipment etc, but resale value of that and an unprofitable mine would be low, so little security there). If you are someone with creditworthiness, then the bank will let you do the above things without a need for margin or collateral, at least up to whatever credit limit they set for you. This is obviously a lot more risky than some sort of secured lending. Finally, I mentioned yesterday that a BB can also "lend" gold to themselves in the process of creating derivative products. Maybe best explained by two examples. Lets say there are a lot of speculators who want to sell futures contracts. A BB will make a market for them and take the other side, going long futures. Now if they let it run to maturity, they would receive physical gold. 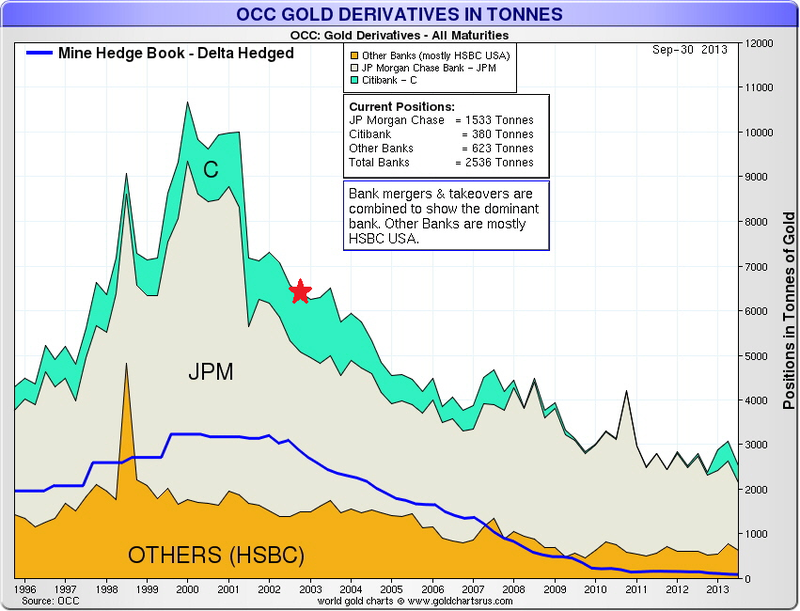 To offset that, or hedge, they borrow gold (from their on call depositors) and sell it. They can then use the resulting cash to pay for the futures contract when it is delivered, and deliver that gold to their on call depositors. In the meantime, therefore, the on call depositors' accounts are “backed” by the long futures contract the BB is holding. On top of these (except for the last three, which are on call) you then have different dates at which all of these contracts will mature, that is, the BB gets the gold back (this is one half of the maturity transformation we mentioned yesterday). By now you should be getting the sense that these “assets” are not entirely certain and have some risk attached to them. Tomorrow I’ll discuss where I think the risk lies, and where I think BBs, and banks in general, underestimate the risks. Nassim Taleb's book Antifragile will be helpful in that regard.